“I was raised by my mother, who used to work for a rich family in Ipanema. It can be said that I grew up between two worlds, and it was something that really made the difference for me. On the one hand, I had the fascinating lifestyle from Ipanema, which the family my mother worked for could offer me. On the other hand, I had my mother and my blood family. Seeing these contrasts taught me many things. I learned that the differences between people sometimes are subtler than the way we imagine them. I noticed how the kids from the family I lived with, despite having an advantage in terms of money and education, were still working hard to reach their dreams. However, I think that growing up with a more fortunate family gave me many opportunities that I otherwise would not have. One thing is the security issue. I lost four cousins for the drug cartels world. And even though they had made their own choices, it is not easy to choose the right way when you don’t have a net of security around you. I have made my choice, and I am grateful for that. I also had examples that helped me to make the right decisions. Not everybody is lucky to have of such a privilege. I got the interest in cooking from my mother. She was a great cook, and many times I reached out for her when I had to cook something to ask her for the recipe. So I started to watch videos about culinary online. After some time, I got the hang of it, and I realized I had a talent to cook. Like many other young Brazilians, I dreamed of being a professional football player, but the people from Karanba made me realize that having a plan B is always a good idea. Eventually, my plan B became my plan A, and now my life revolves around gastronomy. Dream Learn Work gave me the possibility to make my dream come true by helping me to take part in a gastronomy course, which helped me to get my first job as a waiter. Today, I work as a Kitchen Helper at an Italian restaurant, and my dream is to have my own foodtruck. It is important to have dreams, and I feel that Karanba and Dream Learn Work helped me a lot to realize what I really want for myself. 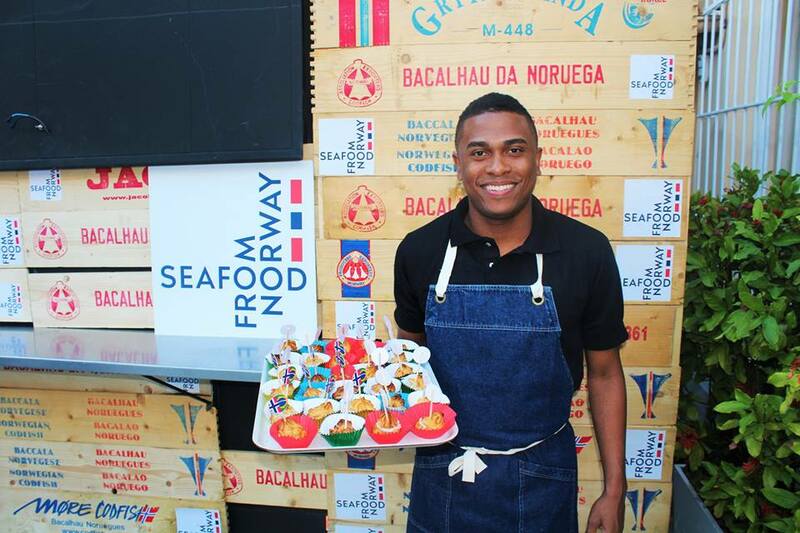 Thanks to Pedro’s education and experience, he got a job during the Norwegian-Brazilian Science and Business week. The Reception was held at the Norwegian Consulate General Residence, where he worked as a Cook Assistant for Denise Guerschman, whose differential is the Norwegian-inspired gastronomy. Both Karanba and Dream Learn Work projects are sponsored by the Norwegian Foreign Affairs Ministry.